There never seems to be enough time in the day. While you may have good intentions to make a healthy home cooked meal, sometimes it just isn’t realistic. One quick meal that surprisingly doesn’t take too long is pizza. Now you don’t have to wait for the delivery man to come over, but you can make it from the comfort of your home in just a few minutes. Blogger and Irish chef Gemma Stafford has come up with a recipe for making pizza in a microwavable cup. Her video that was uploaded last month already has been a huge hit with over 670,000 views and counting. All you need is a microwaveable mug, a few key ingredients and 6 minutes. 1. For the base, mix the dry ingredients together first in the cup. This includes the baking soda, baking powder and a pinch of salt. 2. Then add in the milk and olive oil with a whisk. That’s it for the base! 3. 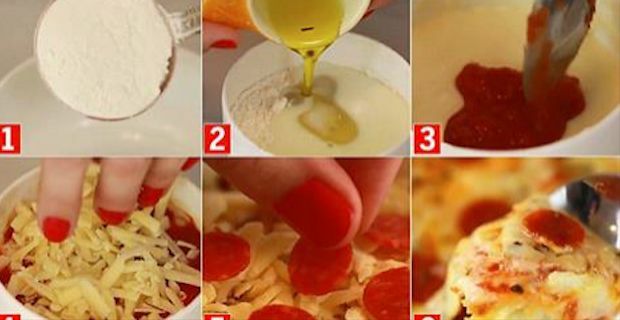 Then spoon the marinara sauce over the top of the base and sprinkle cheese and other toppings over it such as the herbs and pepperoni. 4. Pop it in the microwave for 1 minute and 10-20 seconds or when you see it rising up and bubbling. Then voila, it’s ready to eat!